Human Interface – Cyberpunk miniature skirmish game, two weeks to go and funded. With over 25,000 games played with my version of the Countdown numbers game, I thought it was time for a little bit of analysis on how everyone has been doing. At the time I took the data, 25,374 games have been played, and 15,202 were won. 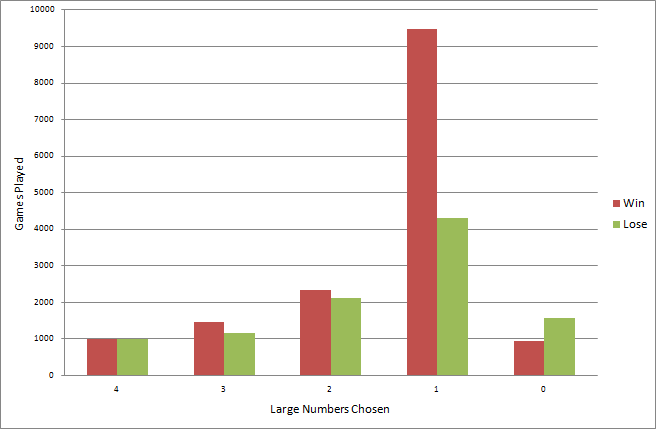 The chart above shows that the most common choice of large number was 1, and that this seems to be the easiest to win with. Choosing 4 or 0 will make your game a lot harder, 2 or 3 large numbers still have more wins than losses. 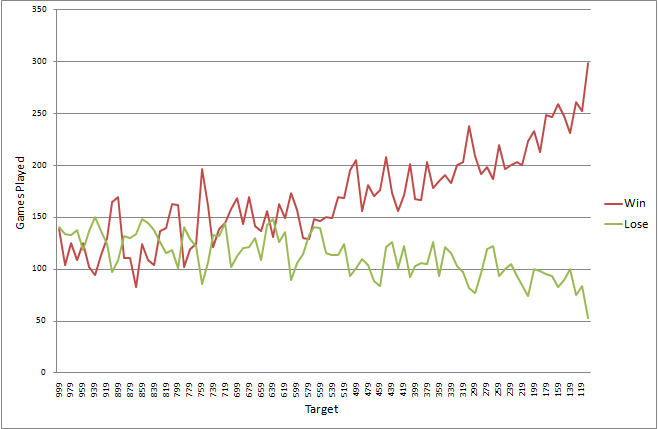 Looking at success of target numbers, we have this slightly confusing graph. All we can say here is that more games are won as the target gets smaller. 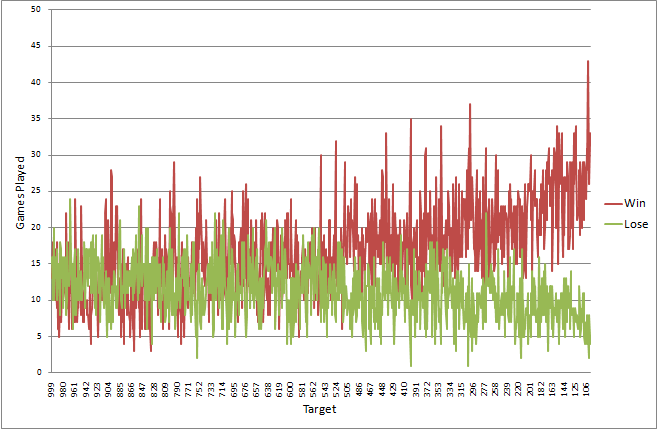 I’ve smoothed out the target numbers in the above graph, so each point is a block of ten possible targets, the winning trend with smaller targets is a lot clearer here. So, don’t be too disheartened if you fail at a high target in the middle of a century, these are really what people are struggling with. I’ve just started recording the date and time that games are played, so hopefully in a few months I’ll be able to come back and look for trends in games played over time, to see which days are most popular, and which days games are won most often in. If anyone wants a copy of my dataset, drop me a line and I’ll be happy to provide it, it stores the target, the numbers selected and if the game was won or lost. The most recent games are also linked with the time they were played. Quite often in a game you’ll be given the chance to take an action, or to pass your turn. If you can act, do it, or have a really good reason not to. If you do something then you’ll force other players to react to you, you’ll be controlling the pace of the game and you’ll have the initiative. If you choose to passively wait then you are handing the advantage to your opponent, they get to choose what happens and when. If you spend all game marshalling your forces to an imagined perfection then you’ll probably find yourself out-manoeuvred by another player who’s moved more quickly and acted decisively. Act when you get the chance and your opponents might make a mistake you can exploit, do nothing and you won’t be able to force these errors. No one will play your games if they don’t know about them. You need to advertise them. The quickest, easiest and cheapest way of doing this is via the web. You need a website, and it needs to link to things. Once you’ve got a website that tells people about your games, you need to help them find it. Be search engine friendly, upload a site map to Google and make sure that you follow all of the rules. Most of all, make sure to have lots of good content, there’s nothing that gets more traffic than great content. Consider the various text advertising services, especially adwords. It’s only worth doing this if you’ve got something on your site that can make you money, never spend money on advertising unless you plan to earn it back (and then some). You’ll notice that Google features a lot, and that’s deliberate. If your website is in the top page for a Google search, you’ll get more traffic. Focus your efforts, pick a small area you can dominate, rather than trying to be strong in many. Seth Godin has more thoughts on this, and other ways to successfully market things. Aim to show people how great you are, and do it in an honest and non-pushy way. Help them find you, but never trick them or mislead. This will help you build an audience and share you games, which should always be the final goal of any advertising you do. Synergy is important in game design. The pieces nned to fit together and interact well. Taking an action in one section of the game should make it easier to progress in another. Synergy between the parts of the game allows this improvement to occur, it lets you plan your strategy and have control over what you are doing, and what you want to do. Degeneracy is the evil twin of synergy, it’s synergy dialled to 11. Things work together so well that they can’t be beaten by other methods, and there’s no reason to not play the degenerate strategy, as it so superior it will win. You can design in synergy, but it’s almost impossible to exclude degeneracy, especially as a game becomes more complex, or involves more pieces. Your playtesters are the people that will find the degeneracy. Get someone who likes poking and pushing until they break things, and they will find the bad. They’ll take the “Protection from Paper” and twin it with a rock. Pick your playtesters well and the degeneracy will be found, so people get to play all of the fun strategies you’ve designed in, not just the one that wins. In roleplaying games not all challenges are combat related, a number of them will require the participants to think, or to solve a puzzle. The most traditional of these puzzles are riddles, and writing your own riddles can be a rewarding way of adding personalisation to your campaign. There are lots of sources of riddles that you can adapt or take wholesale, either online, or from some of our favourite books. The problem with these riddles is that they are not personal to your game, and they provide no challenge to anyone who has heard them before. It is fairly simple to craft your own riddles, but it needs a bit of time and practice to do well, so be sure to leave yourself an hour or so to concentrate on the task, it’s hard to do in a rush or to make up a good riddle on the spot. First off, pick the answer to the riddle, it can either be generic (a cloud, a mountain) or specific (Jenny, the king’s youngest daughter). Once you have the solution, think of a few characteristics of the item (a cloud could be fluffy and white, or dark and foreboding). It generally helps to write these ideas down, they’ll form the core of your riddle. Once you have defining characteristics, you have to turn them into a clue. Riddles are often formed from rhyming couplets. Don’t be afraid to stretch a rhyme a little or to use odd sentence structure, it is almost expected. “A fleece flung high for all to see, reddened at night glad shepherds be” – a cloud. This riddle requires knowledge of old sayings, and also uses the imagery of sheep and shepherds to hide the true meaning. Don’t be afraid to try several versions and shift words around until you feel happy with the way it reads, and also how difficult the riddle feels. Difficultly can be hard to judge, especially when you start out. Test your first few riddles against your players in non-critical situations, the only way to gauge the diffculty is against your play group, as some will solve riddles far better than others. Have fun writing your own riddles, you’ll enjoy it so much more than ripping off the Hobbit, and your players will too.